Fostertown was the ancestral home to the Foster Family and was often the scene of Indian and Commissioner gatherings. 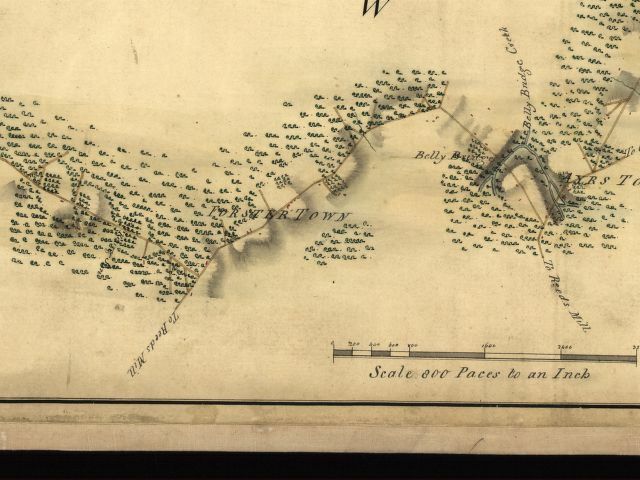 This map was drawn in 1778 as part of the British route across New Jersey during the Monmouth Campaign. The road from Belly Bridge towards Ayrstown forks north to Mt. Holly and south towards Weekping (Reed's Mills on the map). These documents are from the Foster Collection and are arranged chronologically where it can be best determined. They reflect a blended community of both Brotherton and Weekping elders who speak on behalf of the Indians of both locations (separated by about 10 miles). Another example of this relationship is the circuit of Rev. John Brainerd who had established churches at both locales. Two of the documents are from the Gilder Lehrman Institute of NY City. The first, dated 1780, is given in full, and the second, dated 1798,is abstracted from the Institute's website. The community was administered by a council of six male elders (although not all of the men were elderly). At least one woman played a prominent role in the governance of Brotherton: Mary Calvin, widow of Stephen (who had been schoolmaster at Bethel & Brotherton, a colonial interpreter, and a council elder), appears as a signatory on several of these documents. The council was established to administer the "small" affairs of Brotherton. Matters dealing with capital crimes were referred to the New Jersey Indian Commissioers, who had first been appointed in 175_. The primary commissioner was William Foster, founder of nearby Fostertown. When he died in 1778, his grown son Josiah became the primary overseer of affairs at Brotherton. This relationship was to have an unhappy ending. There is a gap in any documents from this time until 1784. This might reflect upon the uncertain times caused by the American Revolution. We do know that in February 1781, Jacob Skikkit visited Josiah Foster and Col. Israel Shreve in an effort to have his son, Robert, released from the army so that he might take a seat on the tribal council (see the page devoted to Robert Skikkit). Statement opposing white settlement on Indian land in Brotherton, New Jersey. Indian Mills, New Jersey 6 January 1780. I acknowldege the Respect you have sheon to me by Wateing on me with the Deutyfull Petition [Prepird] by you the Governor Council and Assembly of this State Request a Law to allow you to Erect another Saw Mill on your tract of Land. For Mr Josiah Foster Esqr. And now having wrote you my views on the several matters sojected to me, shall conclude with adding that your wellfare and Happiness whold afford me a Great satisfaction and the way to Atain it is to live sober be Honest and that will leadt to industry and Industry will afford the necessary comforts of life, and have a tendency to Quiet the mind and prepare us for thea change that will certainly overtake us. Sir, you most obedient and Humble Servnts. To Mr. Josiah Foster Esq. Comr. Description: Statement sent to Joseph Saltar that describes meeting in which the Brotherton unanimously agreed to express their refusal to leave "our fine place in Jersey" in the face of white encroachment. Signed in full by Jacob Skekit and Bartholomew Calvin, and eighteen other Indians. Eighteen years earlier, the same group had expressed alarm over white settlers moving onto their land (see GLC00540.01). Brotherton, New Jersey is now known as Indian Mills in Burlington County, in Southern N.J.